VelocityDC Dance Festival was this past weekend at the Harman Center for the Arts. Shakespeare Theatre Company, Washington Performing Arts Society and Dance/MetroDC presented the event which featured fourteen dance companies from the DC area. I attended the performances on Thursday, October 7th and Friday, October 8th, which were also presented in two performances on Saturday, October 9th. Both nights, attendees were greeted by dancers in the lobby area of Sidney Harman Hall. Jane Franklin Dance climbed and danced on a metal contraption that spun around and could be reconfigured in different ways. Andile Ndlovu of the Washington Ballet performed a beautiful solo piece titled ‘Wording’ while people milled around before the performance. When you walked into the auditorium, you had to breakdance battle with Urban Artistry to get to your seat and groove to the music blasting from DJ BaronhawkPoitier and DJ Obeyah. On Thursday and Friday night, Urban Artistry opened the show with ‘Funk In Focus.’ I’m not well versed in the bboy world, but it looked like a strutting combination that also featured popping and locking solos by the two performers. The piece was followed by flamenco both nights with Furia Flamenca taking a more traditional approach on Thursday with colorful shawls and dresses for costumes and Edwin Aparicio bringing a modern take on Friday with his dancers dressed in sharp black suits. Both were huge crowd pleasers generating a roaring applause from the audience. The Washington Ballet also performed the same routine both nights but with different casts. ‘High Lonesome’ choreographed by Trey McIntyre featured music from Beck’s album Odelay and according to Trey McIntyre Project’s website is an autobiographical piece that premiered back in 2001 by Ballet Memphis. The white streamers hanging from ceiling to floor created a playful set that allowed the five performers to enter and exit the stage in unexpected ways. The juxtaposition between traditional ballet movements and modern hip hop moves also made for a unique twist that captivated the audience. CityDance Ensemble performed both nights as well, but presented two different works. Thursday night they closed the show with Paul Taylor’s ‘Esplanade’ which they also performed at the DC Arts on Foot Festival. Friday night they performed Christopher K. Morgan’s ‘+1/-1’ before Suzanne Farrell Ballet closed out the show with George Balanchine’s ‘Tzigane.’ ‘Esplanade’ had a much warmer reception from the audience than ‘+1/-1’ but I thought the Morgan piece showcased their talent and athleticism more. One of my favorite pieces on Thursday night was ClancyWorks Dance Company’s ‘Driven [by the female heartbeat].’ This piece, which featured four female dancers, started with spotlighted solos – one of which included a crazy headstand balance that generated an audible gasp from the audience. Unique use of lighting and a blend of both individual movements and group choreography created a cohesive modern dance piece. Friday night, Dana Tai Soon Burgess & Company’s ‘Khaybet’ performed by Connie Lin Fink stood out in my mind. 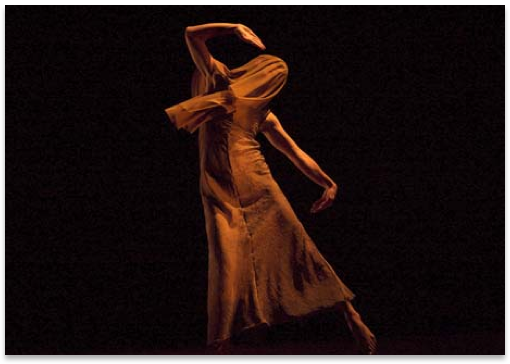 The soloist danced within a sepia tone diagonal light on stage with her face covered by a veil. The haunting image of the dancer and majestic music created a moving piece about death and mourning. Overall, my favorite piece was Liz Lerman Dance Exchange’s ‘Still Crossing,’ performed on Friday night. All ages, races and body types were represented in this piece which featured dancers dressed in different shades of blue. The ethereal lighting and music had somewhat of a sci-fi quality to it, but created a somber setting for choreography that literally moved me to tears. I don’t usually cry in public, but the sight of everyone dancing in unison – including a man with a cane and a man who did not have full movement of his arms – really spoke to me. I hope you’ll get a chance to see this piece sometime. Did you attend the VelocityDC Dance Festival? Which performances did you like best and why? What other dance styles would you like to have seen represented in the show?